In keeping with its Emmy Award-winning tradition of network broadcast technological innovation in its golf coverage which includes SwingVision and ProTracer, CBS Sports will debut for the first time the use of “SMARTCART SVX.” CBS will be the first U.S. broadcast network to use this cutting-edge technology on all PGA TOUR events this season beginning this weekend with third and final-round coverage of the RBC HERITAGE on Saturday, April 16 and Sunday, April 17 (3:00 – 6:00 p.m., ET, both days). 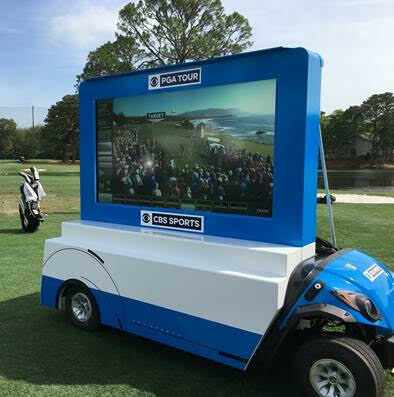 Smartcart, a 72-inch mobile screen attached to a custom fitted golf cart for broadcast applications, will be used by CBS Sports announcers to analyze and telestrate a myriad of data including golf swings and shots, difficulty of holes and scorecards. Smartcart technology brings a new dimension to golf coverage with compelling content from action on the course. This weekend at the RBC Heritage, Smartcart will be positioned on the practice range next to the 10th tee. CBS Sports will use Smartcart at a different course location for each PGA TOUR event throughout the season. CBS Sports broadcasts the 48th year of the RBC Heritage this weekend from one of the most picturesque and popular stops on the PGA TOUR, Harbour Town Golf Links in Hilton Head, SC. Jim Nantz, now in his 31st year covering golf at CBS, serves as anchor of CBS Sports’ golf coverage. Sir Nick Faldo,winner of six majors and more than 40 tournaments worldwide, serves as lead analyst alongside Nantz in the 18th tower. Ian Baker-Finch mans the 17th; Gary McCord the 16th; and Peter Kostis and Dottie Pepper serve as on-course reporters. Lance Barrow is Coordinating Producer and Steve Milton is Director of CBS Sports’ golf coverage. Harold Bryant is Executive Producer and Senior Vice President, Production, CBS Sports. Among the notables competing at Harbour Town are World No. 1 Jason Day, Matt Kuchar, Graeme McDowell, Brandt Snedeker, Billy Horschel, Zach Johnson, Bill Haas, Paul Casey, Kevin Kisner, Webb Simpson, Justin Thomas, Jason Dufner, Luke Donald, Stewart Cink, Ernie Els, Harris English, Kevin Na and five-time Heritage champion Davis Love III. Defending champion Jim Furyk is not competing due to injury.